Greetings Bunnies! It is spring time! Bees and Butterflies are floating around now... Today's episode 108 is a featured show of singer/songwriter, LORRAKON. Lorrakon is Lawrence Alarcon, a singer/songwriter born and raised in Los Angeles, CA. His music has been described as Baroque Pop, and Alternative Indie. Entering the indie music scene in 2018. LORRAKON has released 3 singles, along with a B- side for each track. LORRAKON is currently working on his debut full length album. Co-Star, Marvel Strike Force, Over, Text on Photos & Videos, Logo Shop, Logo Maker, Slidely. Thanks Todd Kelley aka the Big LA for the logo design! It's fresh. Thank you so much for listening and supporting the show! I love you all so much. You mean the world to me. You need to install Flash to see thisplayer. Tonight's episode 107, HOUSE IS A FEELING, is a house music mix featuring DJ RICH KIRBY // UK/ AUS. Rich Kirby has been professionally DJing in The UK in Cambridge, London & Brighton, where he has lived for the last 10 years running successful club nights at Audio (Patterns), Riki Tik & summer beach parties on the terrace at Fortune of War. Career Highlights include DJing NYE in the British Airways i360 pod, second only to play here to local & international legend Fatboy Slim. His style is unique, drawing early influences from Progressive House, undertones that hint of his love of Soul, Hip Hop, UK Garage & R&B, and the backbone of Deep Upfront House music. With 18 years in the industry Rich is Immigrating permanantly to Australia this year to continue and progress his DJ career. Listen to DJ JS-1 Valentine's Day MegaMix from the archives! Gabriel Garzon Montano- Crawl Ten Crack Commandments (14KT Remix)- Notorious B.I.G. 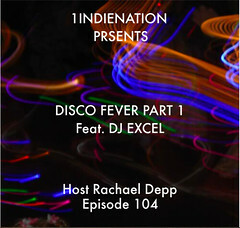 1 Indie Nation podcast explores the authentic essence of Electronica, Rock and Hip Hop culture. It offers an alternative to the mainstream and attempts to bridge generations, genders, and cultures. We offer an independent voice, free from record label and big business imperatives. If you have a mix or song to submit to the podcast, or want to say 'yo', please contact me. Your donations make this podcast possible. Site by Paul Burgess. Say word.